Versatile and sophisticated, the graceful flare of Circulon Symmetry is all about release; recipes coming together as ingredients release their flavors, while the resilient nonstick surface inside and out easily releases foods for effortless clean up, whether by hand or in the dishwasher. 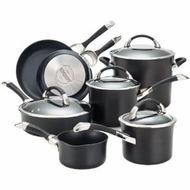 From the small pouring saucepan, perfect for melted butter or pouring warmed stock into sauces, right up through the 8 Quart Covered Stockpot, this set provides nearly every pan a cook needs to prepare a multi-course brunch or a family dinner complete with main course and sides. And as a special bonus, an everything pan, that's useful for… almost everything.